Much like previous reports, the United Nation’s Panel of Experts (PoE) on North Korea utilized misleadingly interpreted satellite footage provided by private firms who have contractual connections to the CIA and Pentagon. The panel’s findings will ultimately be used to support policies that are aimed at playing on North Korean fears and make them more likely to withdraw or engage in counterproductive behavior. The PoE’s claimed that the DPRK has been using an “underwater pipeline” at an oil terminal in Nampo, North Korea to offload fuel it receives by sanctioned methods. Much like with previous attempts to “prove” North Korean behavior with satellite imagery that did not actually show evidence of claimed activity the UN’s contentions are similarly based on shaky grounds. Additional markings on the UN PoE’s images discuss the storage capacity and location of the oil terminal in Nampo but provide no evidence of an “underwater pipeline.” Even more damning, the image provided to NK News by Planet Labs shows a very clear shadow running down its center. This indicates that either two photographs were laid on top of each other and copied, or the original image was creased to hide some detail that would have otherwise been visible. The use of an underwater pipeline is not the standard method by which ships refuel. Previous reports discussing sanctions evasion display photographs showing how ships will commonly lash together before exchanging gasoline above the water line. When ships to take on fuel from land, they will pull up along a dock. These kinds of details might be obvious to anyone with a degree of maritime knowledge but not a layman. Much like with previous attempts to undermine the Korean peace process, the UN PoE has sourced their imagery from private contractors who primarily work with the CIA and Pentagon. The PoE’s satellite footage is attributed to DigitalGlobe. As Disobedient Media has previously reported, DigitalGlobe is an American vendor of satellite imagery founded by a scientist who worked on the US military’s Star Wars ICBM defense program under President Ronald Reagan. DigitalGlobe began its existence in Oakland, CA and was seeded with money from Silicon Valley sources and corporations in North America, Europe and Japan. Headquartered in Westminster CO, DigitalGlobe works extensively with defense and intelligence programs. In 2016, it was revealed that DigitalGlobe was working with CIA chipmaker NVIDIA and Amazon Web Services to create an AI-run satellite surveillance network known as Spacenet. Planet Labs, whose imagery was cited in NK News reports of the UN PoE’s findings, is a private satellite imaging corporation based in San Francisco, CA that allows customers with the money to pay an opportunity to gain access to next generation surveillance capabilities. In February 2016, Federal technology news source Nextgov noted a statement from former CIA Information Operations Center director and senior cyber adviser Sue Gordon that Planet Labs, DigitalGlobe and Google subsidiary Skybox Imaging were all working with the NGA to provide location intelligence. Planet Labs’ own website also lists press releases detailing past contracts for subscription access to high resolution imagery with the NGA. The pervasive involvement of companies providing satellite footage with the CIA in particular is deeply inappropriate. On March 13, 2019 Spanish paper El País reported that the CIA had been implicated in a shockingly violent attack on the North Korean embassy in Spain during the week before the Hanoi Summit. The attack was speculated to be an attempt to gain intelligence on former ambassador to Spain Kim Hyok Chol, who had been appointed by Kim Jong Un to spearhead negotiation efforts with their American counterparts. The involvement of such contractors in a UN panel responsible for overseeing sanctions put into place against North Korea suggests the very real possibility that the entire process is designed to undermine any hope of a denuclearization agreement. The UN’s decision to continue to tout sanctions in the aftermath of the Hanoi Summit can only be interpreted as an attempt by internationalists and American neoconservatives to scuttle President Donald Trump’s attempts to seek denuclearization for the DPRK. Hugh Griffiths, a British national heading the Panel of Experts, was widely quoted by the media as being of the opinion that Chairman Kim Jong Un had only come to Hanoi to try and relieve the pressure of created by sanctions. It apparently did not bother the international and American press that Mr. Griffiths’ mandate does not include giving his opinion about unrelated peace talks. While the stated objective of sanctions is to deprive North Korea of revenue that can be used to finance purchases related to its nuclear program, it is undeniable that they contribute majorly to economic hardship and starvation for the civilian population of the DPRK. In 2018, UNICEF noted that sanctions create severe issues with the delivery of humanitarian aid and put the lives of tens of thousands of children in danger alone. While North Korea’s pursuit of nuclear weapons was certainly what landed them in the situation they currently find themselves in, it is the callous disregard of human welfare by the United Nations, internationalist and certain American interests which causes an increase in such needless suffering. Considering that nations such as Japan have recently moved to suspend efforts to condemn and punish the DPRK for their rights abuses in light of progress made during the negotiation process, the UN’s move to shift the spotlight back onto sanctions is incredibly poorly-timed. The same can be said for US agencies such as the Department of State who have interfered with talks by openly welcoming the Panel of Expert’s report. With a search of just a few minutes on Google Earth along the Chinese-North Korean border, Disobedient Media was able to identify pathways being used by smugglers to move goods in avoidance of sanctions near Kusong-Dong, North Korea. The ease with which this verifiable information could be found shows just how inept and uninterested monitoring bodies and international media organizations are in finding actual evidence of any potential sanctions violations. The failure of these institutions suggests that their efforts are made solely with propaganda in mind. The current drive to highlight supposed bad faith behaviors by the DPRK has absolutely nothing to do with promoting peace or encouraging North Korea to abandon their nuclear arsenal which is as dangerous to them as it is any of their enemies. The increase with which such disingenuous reports have been promulgated since the Hanoi Summit shows the increasing desperation with which certain factions are seeking to maintain hostilities which create a benefit for some but which are ultimately dangerous to the entire world. It seems that there is no low to which such parties will not stoop in order to prevent peace from being realized. A journalist with NBC has resigned from the network with a statement which highlights the immense resistance that ostensibly liberal mass media outlets have to antiwar narratives, skepticism of US military agendas, and any movement in the opposite direction of endless military expansionism. “January 4 is my last day at NBC News and I’d like to say goodbye to my friends, hopefully not for good,” begins an email titled ‘My goodbye letter to NBC’ sent to various contacts by William M Arkin, an award-winning journalist who has been associated with the network for 30 years. “A scholar at heart, I also found myself an often lone voice that was anti-nuclear and even anti-military, anti-military for me meaning opinionated but also highly knowledgeable, somewhat akin to a movie critic, loving my subject but also not shy about making judgements regarding the flops and the losers,” he writes. “I thought that the mission was to break through the machine of perpetual war acceptance and conventional wisdom to challenge Hillary Clinton’s hawkishness. It was also an interesting moment at NBC because everyone was looking over their shoulder at Vice and other upstarts creeping up on the mainstream. But then Trump got elected and Investigations got sucked into the tweeting vortex, increasingly lost in a directionless adrenaline rush, the national security and political version of leading the broadcast with every snow storm. And I would assert that in many ways NBC just began emulating the national security state itself — busy and profitable. No wars won but the ball is kept in play. Arkin is no fan of Trump, calling him “an ignorant and incompetent impostor,” but describes his shock at NBC’s reflexive opposition to the president’s “bumbling intuitions” to get along with Russia, to denuclearize North Korea, to get out of the Middle East, and his questioning of the US military’s involvement in Africa. That’s about as charitably as it could possibly be said by a skeptical tongue. Another way to say it would be that plutocrat-controlled and government-enmeshed media networks hire reporters to protect the warmongering oligarchic status quo upon which media-controlling plutocrats have built their respective kingdoms, and foster an environment which elevates those who promote establishment-friendly narratives while marginalizing and pressuring anyone who doesn’t. It’s absolutely bizarre that it should be unusual for there to be a civilian analyst of the US war machine’s behaviors in the mainstream media who is skeptical of its failed policies and nonstop bloodshed, and it’s a crime that such voices are barely holding on to the fringes of the media stage. Such analysts should be extremely normal and commonplace, not rare and made to feel as though they don’t belong. Click here to read William M Arkin’s full email, republished with permission. This was an actual headline -in big bold type- run by NBC recently. “An Uber driver who allegedly tried to attack police with a Samurai sword outside Buckingham Palace has told a court he became angry after seeing news put out by the Russian television network RT. Actually – no – he did not say he was definitely watching RT. He said and I quote “I think it was RT”. But in many respects this fact is irrelevant. Many news outlets have been covering the tragic war in Yemen. NBC clearly implies that there was some nefarious propagandistic angle to RT’s coverage. 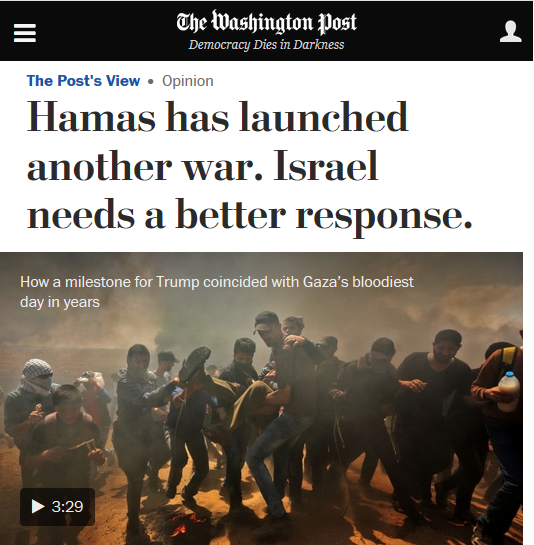 But reporting on war is what news networks do. That is their job. Insinuating that a news network of a country is culpable for an act of terror by covering a news story IS propaganda however. Linking the terror act to Russia by implying a terrorist was provoked by RT News is misleading, deceptive and manipulative. It was the bombing of Yemen by the Saudis that triggered Chowdhury’s angry response. NBC wants you to “shoot the messenger” for delivering the bad news. So who’s being nefarious? The globalists’ mainstream media are incorrigibly dishonest. Chowdhury makes it clear that he was disturbed by the crimes he witnessed. Of civilians – many of whom are women and children – being killed by Saudi bombs with support from the UK and America. Does RT support the pro-Saudi foreign policy of America and UK ? Far from it. RT has been consistently critical of the Saudi campaign of bombing. “Controversial” is a word with a negative connotation. I am reminded of the time, while working as a journalist in Moscow, reading an AP wire report on the confrontation between President Yeltsin and his opponents in Parliament. The lead paragraph spoke of Yeltsin having to deal with “former Communists Alexander Rutskoi and Ruslan Khasbulatov” (the leaders of the revolt in 1993). To an uninformed reader, this portrays Yeltsin as a democratic reformer up against the bad guys. What the wire report failed to mention is that Yeltsin was also a Communist. In fact, Yeltsin was the head of the Communist Party in Sverdlovsk where he protected the powerful local mafia from prosecution. A news organization should try to inform its audience, not willfully deceive. So why is NBC engaging in such poor journalistic activity? What most people do not know is that corporate news networks are journalistic entities in name only. In reality they function as PR departments for what Ray McGovern calls“ the “Military- Industrial – Congressional -Intelligence-Media-Academia-Think-Tank Complex… profiteering on high tension with Russia.” This explains why NBC, CNN and others spin stories and twist facts about RT and Russia in order to misinform its unsuspecting audience. Want to know the real truth? NBC and other corporate media entities think you are dumb. And they want to make you even dumber if they can. By lying. Monday’s casualties included 1,861 wounded, bringing total injuries inflicted by Israel to 6,938 people, including 3,615 with live fire. Israel is using bullets designed to expand inside the body, causing maximum, often permanent damage: “The injuries sustained by patients will leave most with serious, long-term physical disabilities,” says Médecins Sans Frontières (Ha’aretz, 4/22/18). 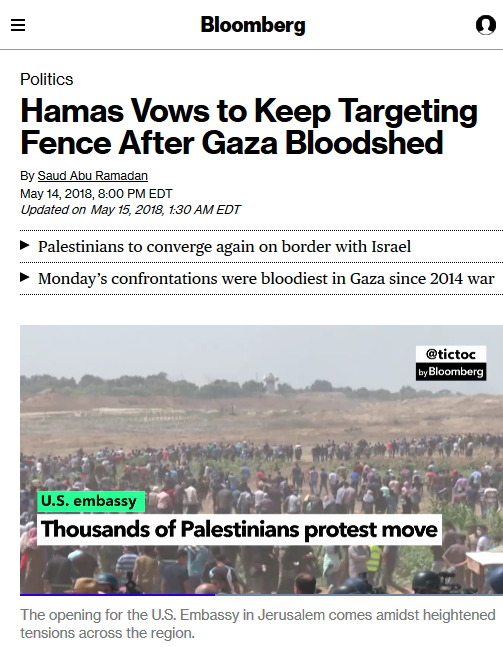 Moreover, like the Times and Bloomberg articles discussed above, the editorial attempts to legitimize Israel’s deadly violence by saying that it is defending a border that Palestinians are attempting to breach, but there is no border between Gaza and Israel. There is, as Maureen Murphy of Electronic Intifada (4/6/18) pointed out, “an armistice line between an occupying power and the population living under its military rule” that Palestinians are trying to cross in order to exercise their right to return to their land. 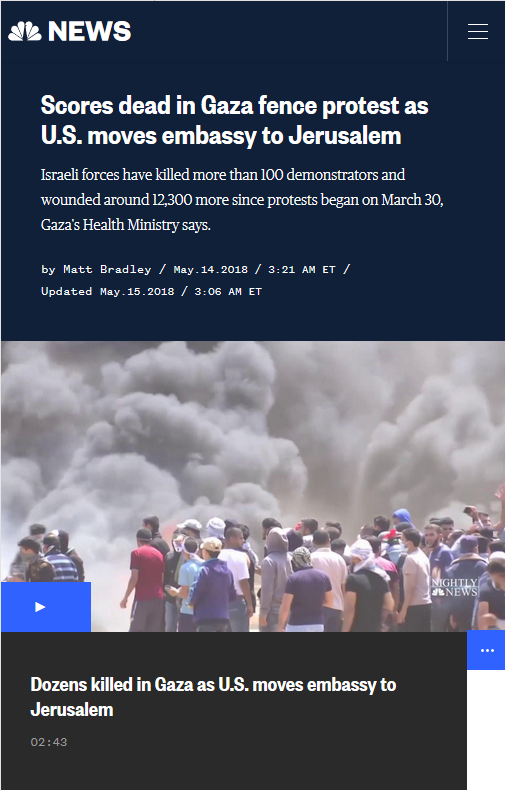 A Business Insider piece (5/14/18) by columnist Daniella Greenbaum described “Palestinian protesters who ramped up their activities along the Gaza strip and, as a result, were targeted by the Israeli army with increasing intensity.” Greenbaum’s use of the phrase “as a result” implies that it was inevitable and perhaps just that Palestinians’ “ramped up activities” led to Israel mowing down a population it occupies, 70 percent of whom are refugees Israel refuses to allow to return to their homes. Currently the senior officials who were so hostile to Donald Trump have decided against going quietly into their generously rewarded retirements. Morell has long been a paid contributing “expert” for CBS news, Hayden has had the same role at CNN, and they are are now being joined by John Brennan at NBC. Brennan, an NBC “senior national security and intelligence analyst,” is an Obama-Clinton loyalist who can be relied upon to oppose policies and actions undertaken by the Trump Administration, admittedly not a bad thing, but he will be doing so from a strictly partisan perspective. And the danger is that his tag as former CIA Director will give him a certain credibility, which, depending on the issue, might not be deserved or warranted. To be sure CIA interests will be protected, but they will be secondary to commentary from a partisan and revenge seeking John Brennan who is out to burnish his own sorry reputation. He looks perpetually angry when he is on television because he is. Brennan has behaved predictably in his new role. In his first appearance on Meet the Press last Sunday he said that the Steele dossier did “not play any role whatsoever in the intelligence community assessment that was presented to President Obama…” which is a lie. He denounced the release of the so-called “Nunes memo” by the House Intelligence Committee because it was “exceptionally partisan,” which is true, and because it exposes secrets, which it does not. Brennan is also a leader of the blame Russia movement. He has claimed without providing any evidence that Russia “brazenly interfered” in the 2016 election and he can be counted upon to be yet one more anti-Russian voice on the mainstream media. Brennan, who was hated by much of the CIA’s rank-and-file during his tenure as director, does not have much of a reputation for truth-telling. He lied about how the Agency under his leadership tried to spy on and disrupt the Senate’s investigation into CIA torture. He was also the driving force behind the Obama administration “kill list” of U.S. citizens selected for assassination. Concerns that Brennan will represent the Agency’s viewpoint on NBC News are largely irrelevant as the network should have instead considered his credibility and judgment before hiring him. US President Donald Trump has called an NBC report that he wanted a tenfold increase in the US nuclear arsenal “pure fiction” and suggested that the network deserves to have its license pulled after a series of reports that were challenged as false. The president said that NBC News “made up” the report which, citing three unnamed officials, said that Trump wanted to dramatically increase the stockpile of US nuclear weapons. “Fake @NBCNews made up a story that I wanted a ‘tenfold’ increase in our U.S. nuclear arsenal. Pure fiction, made up to demean. NBC = CNN!” he wrote on Twitter. “With all of the Fake News coming out of NBC and the Networks, at what point is it appropriate to challenge their License?” he added. “It’s frankly disgusting, the way the press is able to write whatever they want to write,” Trump said Wednesday afternoon, after meeting with Canadian Prime Minister Justin Trudeau in Washington. Last week NBC reported that Secretary of State Rex Tillerson supposedly called Trump a “moron” and threatened to resign, only to be talked out of it by Vice President Mike Pence. That story also cited three unnamed officials. Tillerson told reporters he had “never considered leaving” his post and described the story as “petty nonsense.” The vice president likewise denied the claims in the NBC story. “At no time did he and the secretary ever discuss the prospect of the secretary’s resignation from the administration. Any reporting to the contrary is categorically false,” said Jarrod Agen, Pence’s spokesman. “Why Isn’t the Senate Intel Committee looking into the Fake News Networks in OUR country to see why so much of our news is just made up-FAKE!” Trump tweeted last Thursday, the day after the Senate Intelligence Committee updated reporters about its months-long investigation into Russia’s alleged interference in the US election. Some news outlets will be left “with egg on their face” over their reporting on the Russia investigation, committee chairman Richard Burr (R-North Carolina) told CNN when asked about Trump’s statement. It’s not every day that you’ll hear a news anchor be so upfront about the media’s worst proclivities — but last week, NBC anchor Brian Williams told a panel of guests that the media’s job was to “scare people to death” about North Korea. Keep in mind that Williams is the same anchor who was widely ridiculed for waxing lyrical about the “beauty” of American missiles back in April when President Donald Trump bombed a Syrian air force base. Oh, and he’s also the guy who was suspended from his job for six months for making up a story about coming under fire in Iraq. Clearly, Williams has some issues with romanticizing war. Anyway, what Williams said last week about the media’s role when it comes to tensions between the US and North Korea was remarkably revealing and forthright — even if he didn’t quite mean it that way. Of course, escalating tensions between the US and North Korea are a clear cause for concern. The flippant way that American politicians have been talking about military action, which could have serious consequences for US allies in that region is heinous. The way Trump himself has ratcheted up tensions with threats of “fire and fury” the likes of which the world has never seen is irresponsible and is the kind of talk that sends the media into a frenzy. Fox News recently did a segment on how sales of bunkers have gone up about 90 percent in the last two weeks. CBS Detroit reported on how “end of the world” preparation products, like gas masks and radiation antidote potassium iodide, are “flying off the shelves” in a local army supply store. Media on the other side of the Atlantic are chiming in, too. The UK’s Sun newspaper published an actual World War 3 “survival guide” last week. It’s almost like they’re excited by the prospect of nuclear war. Stories like these are the fruits of the media’s labor over the past few weeks. Their incessant hyping of the situation now has ordinary people stocking their shelves with doomsday supplies and installing nuclear bunkers on their properties. Even a former State Department spokesman for the Obama administration has accused the media of “fanning the flames” when it comes to escalating tensions with North Korea. Reading much of the coverage on the rising tensions with North Korea, it would appear that something major has changed recently — that North Korea has suddenly become an existential threat to the US in a way that it wasn’t before. It all seems so much more pressing and dangerous than it did last month. But what actually happened? Aside from the fact that the leaders of both countries have been having a public shouting match, not a whole lot. Yes, the US government’s Defense Intelligence Agency now believes North Korea has the capability to mount nuclear warheads on missiles, which could potentially be used to hit US targets. But North Korea has been claiming this capability since last March. So, that’s not new. What is new is that the US intelligence community suddenly wants everybody to care about it. This shift should ring alarm bells, because it inevitably means that the US administration is beginning to construct a new narrative — a narrative it will need the media to fully support in the event that they decide to take military action against Pyongyang. The narrative is that Kim Jong Un will, sooner or later, strike the US mainland, potentially with nuclear weapons — and that the US has no choice but to engage in ‘preventive’ war to stop him. The potential consequences — thousands dead in neighboring nations like South Korea and Japan — aren’t given nearly as much airtime or consideration. Who cares if they’re not Americans, right Lindsey Graham? As ever, the media is more than willing to help the intelligence community construct their faulty narratives and sell the public on yet another useless military intervention based on evidence-free assertions that something bad will happen if the benevolent US military doesn’t jump in and stop it… by starting another war. This narrative and the sensationalism with which it is spread relies primarily on the fact that the majority of Americans don’t know a whole lot about the history of their country’s relationship with North Korea. If, for instance, the majority knew that the US had already mercilessly bombed North Korea for three years in the 1950s, they might be more willing to understand that country’s fears regarding US threats of “fire and fury” raining down on them. Historian Bruce Cummings puts it simply: “We carpet-bombed the North for three years with next to no concern for civilian casualties.” The US effectively flattened the country, killed an estimated 3 million people (20% of the population), and “burned down every town”. That is nothing short of pure evil — and yet today, Americans are left wondering why on earth North Koreans don’t like them? All the talk in the world about how oppressive the North Korean regime is, how all-encompassing North Korean propaganda is — will never erase that history. Balanced and nuanced coverage is far too much to hope for, though, when we already have one of the most watched news anchors in America proudly announcing that his job is to scare people to death. Danielle Ryan is an Irish freelance writer, journalist and media analyst. She has lived and traveled extensively in the US, Germany, Russia and Hungary. Her byline has appeared at RT, The Nation, Rethinking Russia, The BRICS Post, New Eastern Outlook, Global Independent Analytics and many others. She also works on copywriting and editing projects. Follow her on Twitter or Facebook. For the last quarter century or more, Western foreign policy has claimed to be guided by promotion of “democratic values,” among which none shines brighter than freedom of speech and the related freedom of the press. European Union institutions have repeatedly been quick to denounce authoritarian regimes in the greater European area for arrests or murders of journalists and for the shutting down of media outlets that crossed some government red line. In the past year, Recep Tayyip Erdogan’s Turkey may have headed the list in Brussels for such offenses, especially since the crackdown that followed an attempted coup last summer. The E.U.’s supposed guardians of the free press also put Vladimir Putin’s Russia on the short list of countries where journalism is said to be severely constrained. However, against this backdrop of European moral posturing, there are troubling examples of how the E.U. itself deals with journalists who challenge the dominant groupthinks. The E.U. finds its own excuses to stifle dissent albeit through bloodless bureaucratic maneuvering. For instance, in April 2016, I wrote about how a documentary challenging the Western narrative of the circumstances surrounding the death of Kremlin critic Sergei Magnitsky in 2009 was blocked from being shown at the European Parliament in Brussels, Belgium. The last-minute shutting down of the documentary, “The Magnitsky Act: Behind the Scenes,” was engineered by lawyers for William Browder, the influential chairman of the investment fund Hermitage Capital and an associate of Magnitsky. Based in London, Browder has been an unrelenting crusader for imposing sanctions on Russian officials allegedly connected to Magnitsky’s death in prison. Browder successfully pushed for the U.S. Congress to approve the 2012 Magnitsky Act and has lobbied the European Parliament to pass a similarly punitive measure. Then, in April 2016, Browder pulled off a stunning show of force by arranging the cancellation of “The Magnitsky Act” documentary just minutes before invitees entered the auditorium at the European Parliament building for the showing. Browder blocked the documentary, directed by Andrei Nekrasov, because it carefully examined the facts of the case and raised doubts about Browder’s narrative that Magnitsky was an innocent victim of Russian repression. The E.U.’s powers-that-be, who had fully bought into Browder’s Magnitsky storyline, did nothing to resist Browder’s stifling of a dissenting view. I got my own taste of the E.U.’s bureaucratic resistance to dissent when I applied to the Media Accreditation Committee of the European Commission on March 2 seeking a press pass to act as the Brussels reporter of Consortiumnews.com. This Committee issues accreditation for all the European Institutions, including the only one of interest to me, the European Parliament. The Committee is a law unto itself, a faceless bureaucratic entity that deals with applicants only via online applications and sends you back anonymous emails. The application process includes several steps that already raise red flags about the Commission’s understanding of what it means to be from the “press” or a “journalist” deserving accreditation in the Twenty-first Century. First, under the Committee’s rules, a journalist must be a paid employee of the given media outlet. This condition generally cannot be satisfied by “stringers” or “freelancers,” who are paid for each assignment or an individual story, a payment arrangement that has existed throughout the history of journalism but has become more common today, used by mainstream media outlets as well as alternative media, which generally pay little or nothing. I satisfied that requirement with a Paypal credit note from Consortiumnews. The Commission also must have the media outlet on its approved list. Regarding Consortiumnews, an Internet-based investigative news magazine dating back to 1995 and operating in the Washington D.C. area, the Commission apparently wasn’t sure what to do. So, like bureaucratic institutions everywhere, the Committee played for time. It was only on June 6 that I received the review of my application. The finding was that 1) I needed to present more proof that my employer is paying me regularly, not just once, and 2) I needed to supply further articles showing that I am not merely published regularly, as was clear from my uploaded articles with the initial application, but that I am published precisely on the subject of activities at the European institutions. In fact, I had withheld from my application my most recent published essay on a panel discussion in the E.U. Parliament devoted to censuring Russia’s alleged dissemination of “fake news.” That discussion was run by a Polish MEP and former Polish Minister of Foreign Affairs from the determinedly anti-Russian party of the Kaczynskis. The title of my essay was “Europe is brain dead and on the drip.” I had felt that this particular piece would not further the cause of my press pass. Still, the insincerity of the E.U. press accreditation committee’s response to my application is perfectly obvious. A journalist can write articles about the European Institutions when he or she has free run of the house via a press pass and can ascertain what is going on of interest. Without a press pass, you do not know what or whom is worth covering. And in this connection, “specific press events” are among the least desirable things going on at the E.U. for purposes of a genuine practicing journalist. They are useful only for lazy journalists who will send along to their editor the press release and a few canned quotes obtained by showing up at a press briefing in time for the coffee and sandwiches. In short, I will not be issued a press pass and the Committee will not bother to address the real reason for refusal: that Consortiumnews is not on the Committee’s short list of acceptable media. Not to mince words, this is how the E.U. bureaucracy manages skeptical media and stifles dissenting voices. Meanwhile, the mainstream Western media continues to hammer home its propaganda narratives, especially regarding Russia. Another case study unfolded over the past week with NBC’s new star reporter Megyn Kelly interviewing Russian President Vladimir Putin on June 2 on the sidelines of the St. Petersburg International Economic Forum. This latest NBC crime against professional journalism becomes apparent when you compare the full version of the interview as it was broadcast on Russia’s RT network and the edited version that NBC aired for its American audience. The most shocking discrepancy involved a segment in which Kelly aggressively questioned Putin about what she said was Americans’ understanding of his government, namely one that murders journalists, suppresses political opposition, is rife with corruption, etc. In the NBC version, Putin’s answer has been cut to one empty introductory statement that “Russia is on its way to becoming a democracy” bracketed by an equally empty closing sentence. In the full, uncut version, Putin responds to Kelly’s allegations point by point and then turns the question around, asking what right the U.S. and the West have to question Russia’s record when they have been actively doing much worse than what Kelly charged. He asked where is Occupy Wall Street today, why U.S. and European police use billy clubs and tear gas to break up demonstrations, when Russian police do nothing of the sort, and so on. Simply put, NBC intentionally made Putin sound like an empty authoritarian, when he is in fact a very sophisticated debater, which he demonstrated earlier in the day at an open panel discussion involving Kelly who became the event’s laughingstock. Regarding the bowdlerized interview, NBC management bears the prime responsibility for distorting the material and misleading its viewers. Interviews by serious news organizations can be “hard talk,” as the BBC program of the same name does weekly. The journalist in charge can directly and baldly challenge a political leader or other public personality and can dwell on an issue to arrive at exhaustive responses that then allow viewers to reach their own conclusions. However, in the interview at hand and in the earlier panel discussion, Kelly repeated the same question about alleged Russian meddling in the U.S. election even after she had received an exhaustive answer from Putin several times. Clearly she was reading from a script given to her by management and was not permitted to react to what took place in the interview exchange. Given that Putin’s answers then were shredded in the NBC cutting room, we may explain the objectives of NBC’s executives as follows: to present themselves and their featured journalist to the American audience as being so respected by the Kremlin that the Russian president accorded an exclusive interview. Second, to show the American audience that they used the opportunity not to allow the Russian President to pitch his views to the U.S. home audience but instead to hit him with all the charges of wrongdoing that have been accumulating in the American political arena. In other words, NBC got to show off Kelly’s supposed boldness and the network’s faux patriotism while sparing the American people from hearing Putin’s full answers. Although this emerging paradigm of righteously suppressing challenges to mainstream narratives appears to be the wave of the future – with the modern censorship possibly enforced via Internet algorithms – some voices are protesting this assault on the Enlightenment’s trust in human reason to sort out false claims and advance factual truth. At the May 25 commencement at Harvard University in Cambridge, Massachusetts, Harvard President Drew Faust delivered an impassioned defense of free speech. She spoke about the institution and its obligations as generator and protector of “truth” and knowledge arrived at by free debate and challenge of ideas. This is not to say that there was perfect clarity in her message. She left me and other attendees somewhat uncertain as to whose rights of free speech she was defending and against what sort of challenge. Given the political persuasion of students and faculty, namely the middle-of-the-road to progressive wings of the Democratic Party, one might think she had in mind such causes célèbres as the ongoing verbal attacks against Linda Sarsour, a Muslim (Palestinian) graduation speaker at CUNY. Indeed, in her speech, Drew Faust pointed to the more vulnerable members of the student body, those from minorities, those from among first generation college students who might be intimidated by hurtful speech directed against them. But it is more likely that she drew up her speech having in mind the controversy on campus this spring over the rights of speakers disseminating hated ideas to appear on campus. That issue has come up repeatedly in the student newspaper The Crimson, and it may be said to date from the scandal at UC Berkeley over the cancellation of controversial far-right speaker Milo Yiannopoulos. Though this idea rests at the heart of the Enlightenment, it has faded in recent years as various political and media forces prefer to simply dismiss contrary evidence and analysis by stigmatizing the messengers and – whenever possible – silencing the message. This approach is now common inside the major media which lumps together cases of fact-free conspiracy theories and consciously “fake news” with well-researched information and serious analyses that clash with conventional wisdom. From my experience as an organizer of public events over the past five years, I learned that the very word “debate” finds few defenders these days. Debate suggests conflict rather than consensus. The politically correct term for public discussions of even hot issues is “round tables.” No sharp corners allowed. Besides the value of honest debate as a method for ascertaining truth, Faust also noted that suppression of diverse opinions can blind those doing the suppression to growing unrest among the broader public, an apparent reference to the surprising election of Donald Trump. Faust continued: “Silencing ideas or basking in intellectual orthodoxy independent of facts and evidence impedes our access to new and better ideas, and it inhibits a full and considered rejection of bad ones. From at least the time of Galileo, we can see how repressing seemingly heretical ideas has blinded societies and nations to the enhanced knowledge and understanding on which progress depend. Of course, the inconvenient truth is that Harvard University has long been a “bubble,” especially in the area of policy research that most interests me and may be vital in avoiding a nuclear catastrophe: Russian studies. Over the past few years of growing confrontation between the U.S. and Russia, amid vilification of the Russian President and the Russian people and now encompassing the hysteria over “Russia-gate,” colleagues with long-standing and widely acknowledged expertise in Russian affairs including Ambassador Jack Matlock and Professor Stephen Cohen have been repeatedly denied any possibility of participating in “round tables” dedicated to relations with Russia that might be organized at Harvard’s Kennedy Center or the Davis Center. These policy centers have become pulpits to stridently expound orthodoxy per the Washington consensus. Thus, the flaccid argumentation and complacency of U.S. foreign policy are aided and abetted by this premier university, which, along with Columbia, created the very discipline of Russian studies in 1949. So, by wallowing in this consensus-driven groupthink, Harvard contributes to dangerously biased policies that could lead to World War III. In that case, truth – or as Harvard might say, Veritas – would not be the only casualty. No doubt there are other faculties at Harvard which also are desperately in need of renewal following President Drew Faust’s call for debate and free speech. Nonetheless, Dr. Faust’s celebration of open debate and free speech represented a welcome tonic to the close-mindedness of today’s Russia-bashing. Her speech is all the more noteworthy as it marks one of the first steps by liberals and Democratic Party stalwarts to acknowledge that those whom Hillary Clinton condemned as “deplorables” must be heard and reasoned with if U.S. democracy is to become great again. Gilbert Doctorow is an independent political analyst based in Brussels. His last book, Does Russia Have a Future? was published in August 2015. His forthcoming book, Does the United States Have a Future?